6.0L Powerstroke Engine FanThis fan blade is a Ford direct replacement unit for all 2003-2007 6.0L F-Series trucks and 2003-2010 6.0L E-Series vans. If you have a cracked or damaged fan blade assembly in one of these vehicles, this is the correct replacement part. 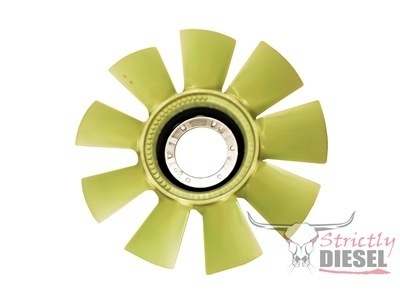 This fan blade is a Ford direct replacement unit for all 2003-2007 6.0L F-Series trucks and 2003-2010 6.0L E-Series vans. If you have a cracked or damaged fan blade assembly in one of these vehicles, this is the correct replacement part. This blade can also be used in "Cummins Conversion" applications. See the details on the Cummins Fan Hub Adapter page of our site.